Upper right margin: And they sent the idolaters before Saul’s assembly [saying], "Each one of you, branding [yourself], send the right eye, otherwise I will gather troops [and] come to annihilate you." Saul demanded a cow and cut it to pieces and sent each piece to a city [threatening], "if you do not fall upon the enemy, just as I tore the cow I shall do onto you the same." Lower right: After that time, Saul gathered three hundred and thirty thousand persons and attacked the enemy. Upper right margin, corner: Here Nahash the Ammonite, having sent [a message] to the Children of Israel [saying], "If each one of you will pluck out your eye, well and good, otherwise I will come and destroy you," [when] Saul was informed of this, he chopped up an ox [and sent a piece to every (Israelite) city]. 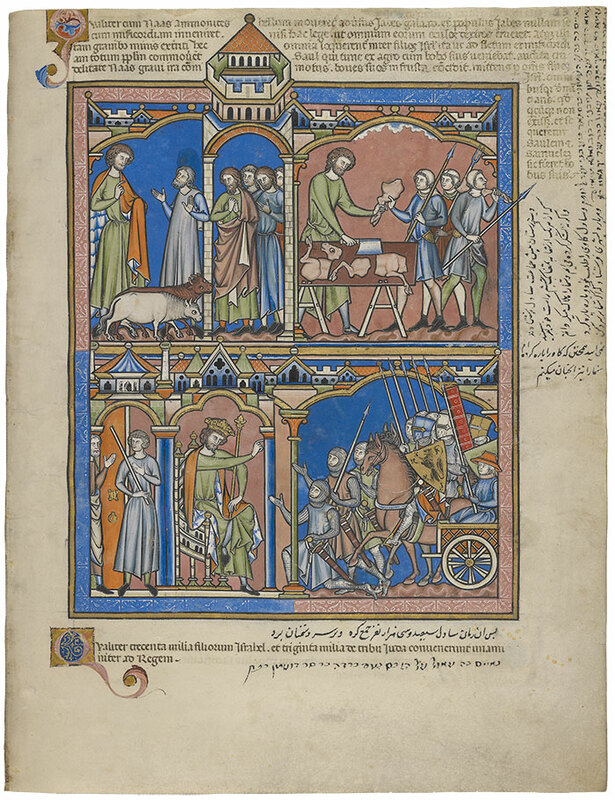 Lower right, beneath Latin: Here Saul assembles three hundred and thirty thousand people and leads [them] against the enemy. Italicized words are in Hebrew.